I’ve been blogging for less than a year and this will be my third mention of Supper. I really, really love the place. What can I say? When my new friend, Wendy, told me that she was organizing a Philly Food Bloggers Meet-Up at Supper, all I could say was yes and YES! The chance to meet other food bloggers AND have a tasty brunch at Supper was exciting on so many levels. The menu looked divine and the fabulous owners, Jen and Mitch Prensky, promised to have a small, passed versions of some of their most popular brunch menu items with a special nod to us bloggers–they had a full sized version of each dish for photography purposes. LOVE these guys! I walked into the restaurant on the cool Saturday afternoon and headed upstairs to Supper’s private dining room where Wendy and other food bloggers milled about with their mimosas in hand. I grabbed a hot apple beignet and quickly started chatting with Wendy, Helen and Tenaya (no handshakes due to finger-lickin’ greasiness from the beignets) before making my way to the bar. Somewhere along the way I had my first taste of the morning–Dock Street porter pancakes with candied apples, vanilla suds and homemade cracker jacks. 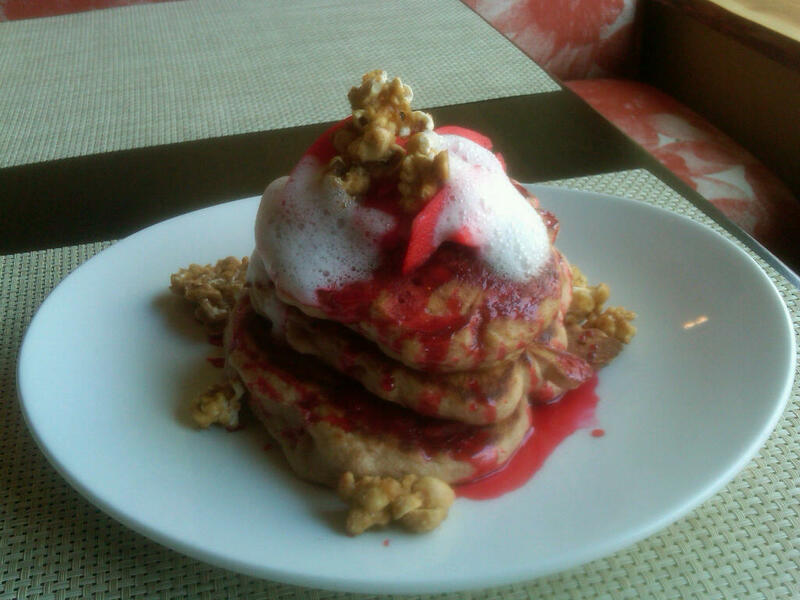 I loved the strong vanilla flavor in the foam and the “cracker jacks” made for a great crunch amidst the dense chewiness of the pancakes. While standing at the bar, I got a chance to chat with the fabulous tag team couple behind 22nd & Philly. Ironically, my husband played youth soccer with Mr. 22nd & Philly so it was fun to get to know him and his wife a little better. While we were chatting, we got comfortable with one another pretty quickly. 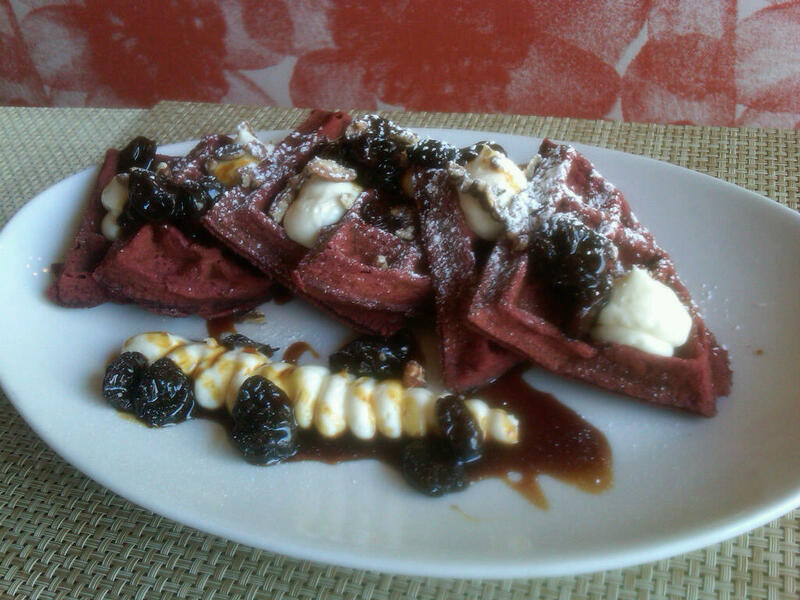 You have to when you’re eating dessert for brunch like Supper’s RENOWNED red velvet waffles with cream cheese mousse and bourbon cherries. Things tend to get a little racy. Isn’t that just stunning? I will say that I enjoyed the small portion of it and don’t know if my (minimal) sweet tooth could handle an entire serving of this luscious dish. While our hungry group milled about, Mitch and Jen did more than just organize the event. They were kind enough to chat with us, entertain us with stories (Mitch’s professional background is fascinating) and even pose for pictures. 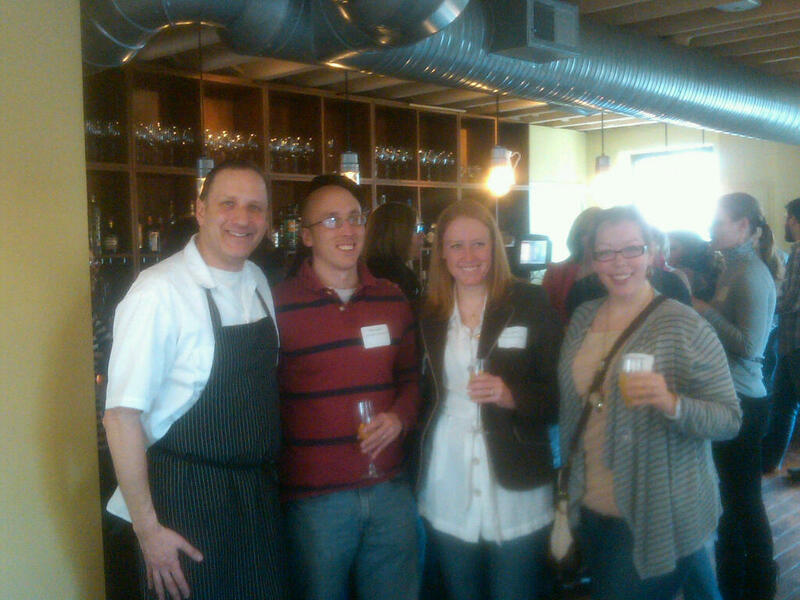 He is pictured below with the folks from 22nd & Philly and my friend, LeeAnne. 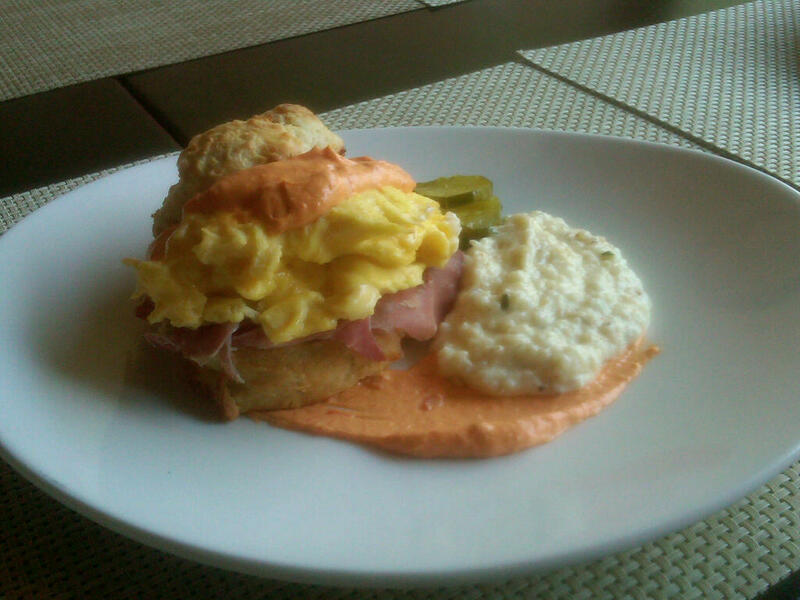 I could have eaten about 37 of the Dixie biscuits with scrambled egg, ham and pimento cheese. 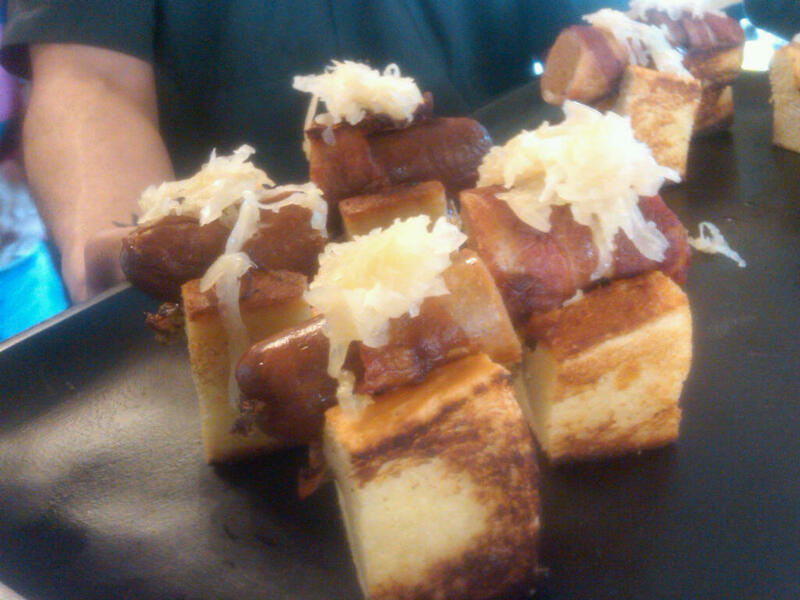 These little sliders were awesome but the grits that accompanied the full-sized verion were buttery and divine! 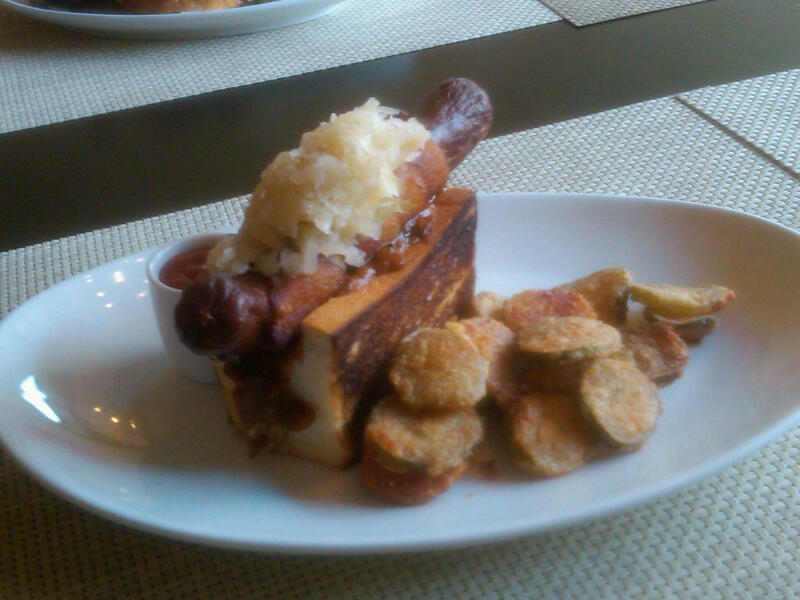 On the “lunch” side of brunch, Mitch and Jen served two of their favorite menu items–the Supper burger and Supper dog. 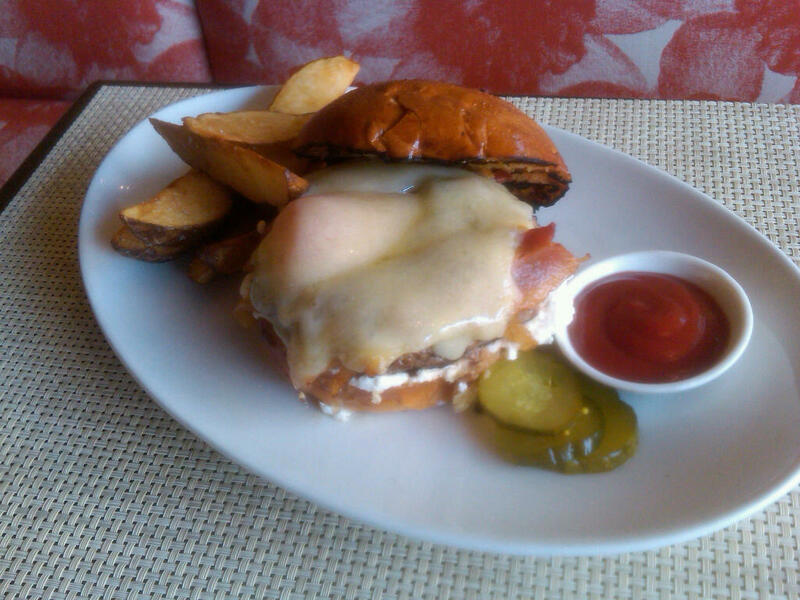 I first had the burger at the Hair o’the Dog Brunch on New Year’s Day–there was no better hangover cure than the juicy burger with caramlized onions, roasted tomato, bacon and gruyere. The baby burgers were super cute and a perfect three-bite taste. The Supper dog was my hands-down favorite (although the Dixie biscuit was a very close second.) You may remember that I don’t really eat pork. Well, folks, the Supper dog ruined that for me (I’m obviously really disappointed about that!) The dog is 100% pork shoulder wrapped in bacon and deep fried (!!!) with sauerkraut, bbq onions and a beer mustard on a split top roll. This is what they looked like in the mini version. But check out this full-sized monster of a dog. I love how it’s perched so daintily atop the split top bun. Wow. I just loved everything about this dish. Oh, and once the photos were all taken, those fried pickle chips disappeared in a heartbeat. I could have eaten those guys all day long. Aside from the afternoon’s food, which was phenomenal, it was great getting to put faces to the names of the folks I know from Twitter and the the blogosphere. Many, many thanks to Mitch and Jen for a mouth-watering spread and great company to boot! If you haven’t been to Supper, you’re definitely missing out. we were away last week so just catching up… great recap! SO true about those waffles 😉 let’s do dinner sometime soon! After viewing the photos alone I find I don’t have to eat for the rest of the month. Excellent use of color in all that food. The role of color in food is something I learned–among other things– from the woman I married.